50 YEARS of FLEETWOOD MAC!!! I'm not entirely sure because the sources don't agree, but I think that 50 years ago today, Fleetwood Mac was born; as Peter, John and Mick recorded a few studio tracks: 'Fleetwood Mac', 'First train home', ''No place to go' and 'Looking for somebody'. What history!!! I mean, what band has this amount of changes and history that is still going?? Last edited by BLY : 04-22-2017 at 09:00 AM. ...17 studio albums (plus loads of non-studio album tracks) and yet 12 of your 18 songs are Rumours-era, i.e. representing 6 albums. The post-Rumours bands are not represented at all. Last edited by FuzzyPlum : 04-22-2017 at 09:04 AM. ...17 studio albums (plus loads of non-studio album tracks) and yet 10 of your 18 songs are Rumours-era, i.e. representing 6 albums. The post-Rumours bands are not represented at all. Yet again, the studio version of 'The purple dancer' has been left out. No excuse for that! ....so right. Ok we need a new 5 cd box set. Only 4 songs from the 1970-1974 period. Only one Danny Kirwan song. The Time band didn't exist. Only one song after '87. Would people really need 2/3 of the Rumours songs again? My formula was pretty easy. I went with the big hit singles from the Peter Green years, all of the top-40 singles from the classic years, the most essential from that middle period, and most of the staples from FM/Rumours. Time and SYW didn't have top-40 hits or concert staples. On the basis that the missing posts may not return, I'm re-posting my somewhat improbable playlist for a single 50 years of Fleetwood Mac CD for the record. Each of the 17 and a bit studio albums gets one track, plus a Peter Green representative single and Tusk (as a double album) and Rumours (well, because) get two. A rewarding and eclectic listen in my humble and biased opinion. It helps that Chris, Peter and Lindsey (twice) appear on tracks when they weren't part of the band. Last edited by Mr Scarrott : 06-04-2017 at 08:22 PM. 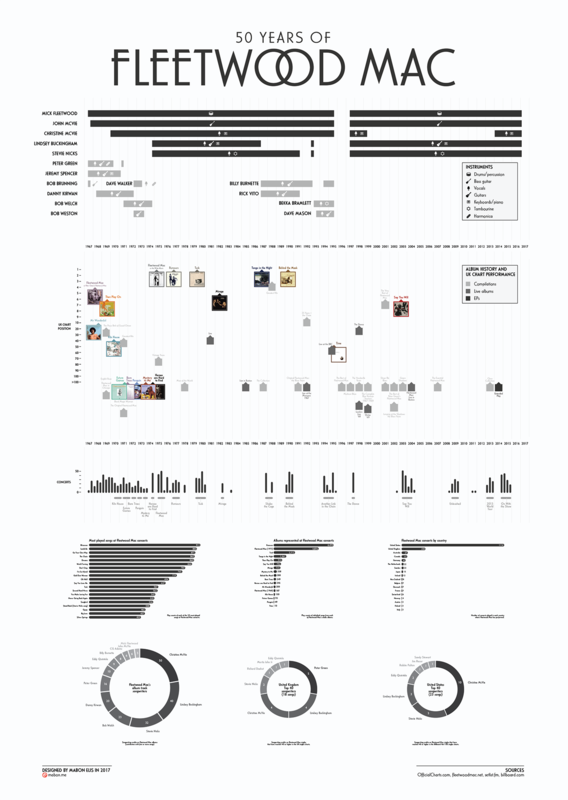 A infographic poster with a timeline of Fleetwood Mac's 50 year history. The band Fleetwood Mac turns 50 years old in 2017. To celebrate this, I made an infographic poster to show some of their history between 1967 and 2017. The main element of the poster is this timeline. I wanted to show how the lineup of the band has changed over the years. Fleetwood Mac has had a total of 15 band members. Its current lineup, comprising Mick Fleetwood, John McVie, Christine McVie, Lindsey Buckingham and Stevie Nicks, has been its most popular and is behind the band's most successful albums. I have also included some information about Fleetwood Mac's concerts, using data from setlist.fm. Their concerts and tours are included in the timeline, and separate graphs show how many times each of their most popular songs have been played in these concerts and where they took place. Finally, I wanted to see how each band member and other songwriters had contributed to Fleetwood Mac's albums. Christine McVie is the band's most prolific songwriter, having written or co-written a total of 50 album tracks. She has also written more US Top 40 singles than any of the band's other songwriters, including Everywhere, Little Lies and Over My Head. Original band member Peter Green, who formed the band but left in 1970, has written the most UK Top 40 singles, including the band's only UK number one – 1968's instrumental song Albatross. I wanted the poster's title and colour scheme to resemble the band's most recognisable album, Rumours.